We have some exciting news for you! 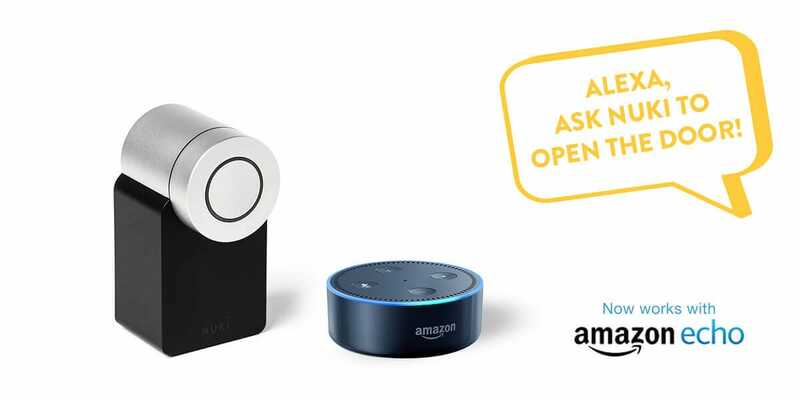 From now on you can also control your Nuki Smart Lock with Amazon Alexa! The Nuki Smart Lock is the first smart door lock in Europe with Alexa voice control. After the very successful Amazon market launch in March, the Alexa integration was the next big step in our partnership with Amazon. You don’t have to use the workaround through IFTTT anymore to control your door by voice commands. Simply activate the Nuki Skill in your Alexa app and connect it to your Nuki Web account to control your Smart Lock with your voice. Your friends come together for dinner and you are preparing the last things in the kitchen? From now on you don’t have to go to the door or search your smartphone anymore, because Alexa opens the door for you. Even if you want to check if your door is locked and your smartphone isn’t next to you, you don’t have to get up from your couch! Just ask Alexa for the state of your Smart Lock or for the activity log! To control your Smart Lock with Alexa, you have to activate the Nuki Skill in your Alexa app and give it access to your Smart Lock via Nuki Web. After that you can set your PIN for unlocking your door and you are ready to control your Smart Lock with your voice. To unlock your door via Alexa you have to set a PIN. This is required by Amazon for security reasons and protects your home from unauthorized entries, since Alexa has no voice recognition. The PIN protection is very important to us for the integration of the Alexa Skill, since it complies with our strict Nuki security concept. You can find more information about the Nuki Skill and details on the interaction with Alexa in our support section. Have fun with this new feature! Note: To use this skill you need a Nuki Bridge and a free Nuki Web account.